Whether you call them cold cuts or luncheon meat, those things you buy in the deli case or from packages in grocery stores, or get in sandwich shops like Subway, all are loaded with sodium. Eating them is strictly a no-no on a low-sodium diet. I dearly miss cold cuts. As a child, I ate bologna sandwiches daily. On Saturday’s we would have ham, salami, roast beef and bologna sandwiches as a lunch treat. And getting a hero sandwich from the local Italian deli that included salami, ham and a host of other cold cuts was truly amazing. Subway has pledged to cut the sodium in the cold cuts it uses and I recently noticed some Sara Lee reduced sodium offerings in my local Jewel supermarket. I quickly checked them out, hoping perhaps I could again have some sliced turkey or ham. But when I checked the nutrition panels I was sadly disappointed. 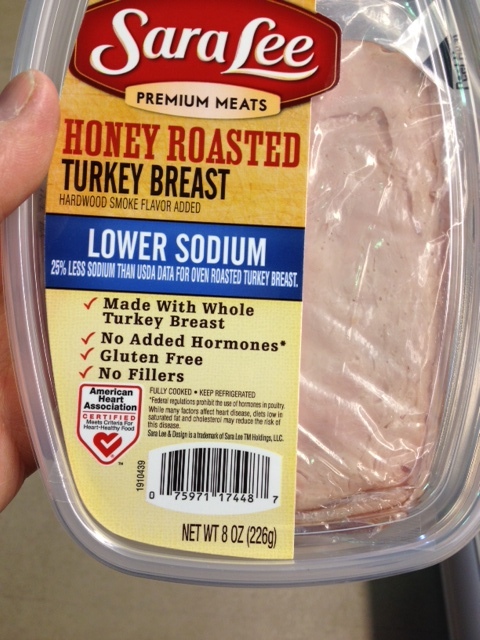 The lower sodium oven roasted turkey has 390 mgs in two slices (the company website says 340 but the package says different). I would normally need at least four slices for a sandwich, so that would be 780 mgs. Add in the sodium in regular bread and you could easily have a 1,000 mgs sodium sandwich, almost all of my daily salt allotment. ..still has too much sodium. The honey roasted turkey breast came in at 300 mgs of sodium for two slices, and noticeably more sugar, 8 grams compared to 1 gram in the oven roasted. 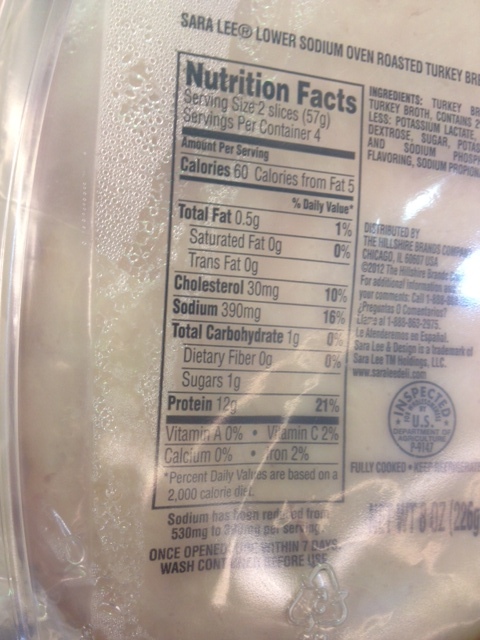 A reduced sodium ham also had 300 mgs per serving of sodium. Thanks, but no thanks. How the American Heart Association can lend its name to products like this is simply beyond me. Shame on you AHA!